Although I have covered a large number of science applications in the past, I haven't really looked at too many options available within the KDE desktop environment. This has been due to my own biases in using a GTK-based desktop environment, but now I'd like to look at some of the packages available for people who really like to use KDE on their own machines. So, let's start with the KStars astronomy program. 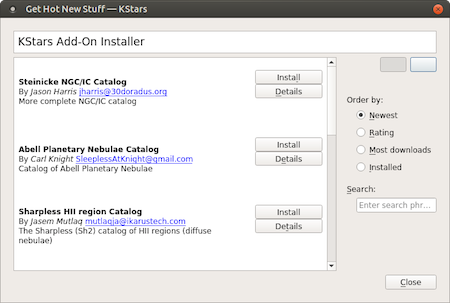 If this is the first KDE-based application that you are installing, it also will need to pull in a rather large set of dependencies—that's just the price of using a new GUI toolkit. Of course, any other packages will be incrementally smaller since all of the shared dependencies already will be there. 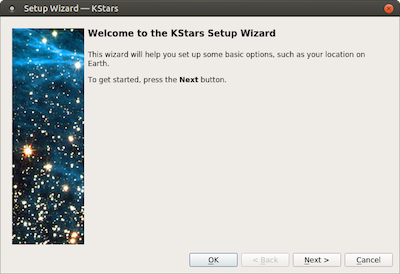 To launch KStars, you either can click on a menu item in your desktop environment or enter the kstars command in a terminal window. The first time you start KStars, you need to go through the setup wizard to configure elements like your location. Once KStars finishes starting up, you should see a display of the sky from the location you set during the setup. Figure 1. When you first start KStars, you need to go through the setup wizard. Figure 2. You get a display of the sky from your location when KStars starts. 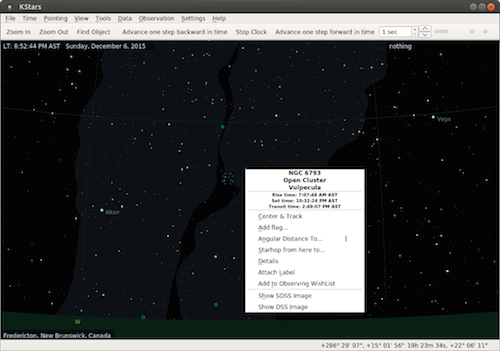 You can pan the display around simply by clicking and dragging the star field to see locations of interest. The items that are labeled depend on your zoom level. Two buttons at the top of the display allow you to zoom in and out. Beside these is a third button, labeled Find Object, that you can click on to get a search window. 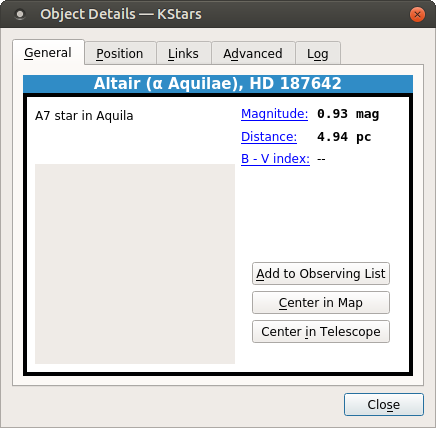 This window can use filters to search for particular types of objects, like comets or asteroids, or you can search through all of the objects that KStars knows about. Once you find an object of interest, you can click on it and have the display move around until the object is in the center of the display. If it is below the horizon, a warning box will pop up asking if you still want to re-center the display. Once you have selected your object, you can right-click on it to get a drop-down menu of things you can do with it. Figure 3. You can interact with the objects in the display. The header of this drop-down contains the full name of the object, along with rising and setting times. 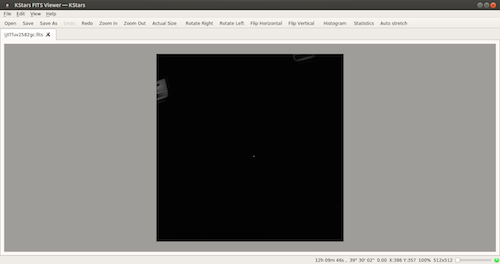 Below that, the first option is to center and track the object. This is useful because the default display mode is to have the display updated in real time. This way, you always have a view of what the sky looks like right now. You can select the details option to pull up even more information on the object. Figure 4. The detail window has a lot of extra information available for most objects. You can add a flag to make the object easier to keep track of or even add tracks as the object moves across the field of view. You also can calculate the angular distance to another object or plan out a star-hopping path to some other object. For some objects, there may be images from the Deep Sky Survey available. If they are, there will be options on this drop-down menu labeled "Show DSS Image" or "Show SDSS Image". Although KStars comes with quite a bit of data when you install it, this isn't everything that is available. You can add new data sources by clicking on the menu item Data→Download New Data. This will open up a new dialog window giving you a list of what data catalogs are available to download. Figure 5. Several extra data sets are available that you can download and install. For some of the data sets, like comet and asteroid information, there is a constant updating of the detailed information available to the astronomical community. You can download those updates by clicking on the menu item Data→Updates→ and selecting which catalog to update. You even can import your own data by going to the configuration window and clicking the Import Catalog... button on the Catalogs section. When you are in the configuration window, you can see that you also can change settings on how to view several different categories, such as solar system objects, satellites and supernovae. 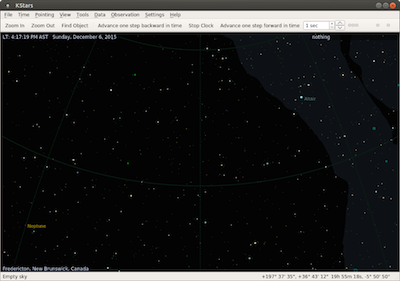 The guides section defines what extra information is displayed, such as constellation lines, names and the Milky Way. The INDI (Instrument Neutral Distributed Interface) section controls how KStars talks to your connected telescope. You can pull up the telescope wizard by clicking on Tools→Devices→Telescope Wizard. Figure 6. You can add a telescope as a device under the control of KStars. Once the connection is made, you can pull up the control panel and send instructions to your telescope. You can even automate your observations using this functionality. Clicking on the menu item Observation→Observation Planner will pop up a window where you can define a complete set of observations you want to run. If it is a bit confusing at first, a wizard is available to help walk you through setting up a plan. Figure 7. 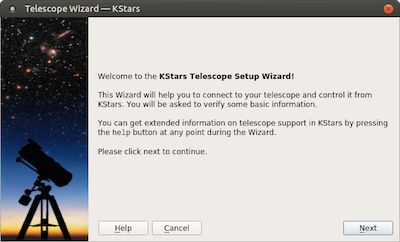 Once it is connected to your computer, you can use KStars to control your telescope. While you will make your own observations, you also may want to look at observations made by other researchers. The file format most often used is the FITS format (Flexible Image Transport System). KStars includes a FITS viewer, which has a number of analysis tools. You can open a FITS file by clicking on File→Open FITS. Several tools are available to work with the data in the image. You can look at the basic statistics of the image, including the width, height, maximum, minimum and mean of the pixels. You can pull up a histogram, showing the frequency spread of the image data. The View menu item includes several more tools where you can equalize the image, pass it through a high contrast filter or apply an auto stretch. There is even an entry to mark any stars that KStars can identify automatically. Figure 8. The FITS viewer lets you analyze and manipulate observational images. You now have another astronomy program in your toolkit that you can use when your scientific research moves in that direction. In the coming months, I plan to look at other scientific software packages within this desktop environment and see just how much research can be done with KDE.